Track and proudly show off your travels throughout the United States on your very own Gallery Wrapped Classic Canvas Wall Map. We have partnered with the map gurus over at National Geographic to personalize and print this highly detailed map on premium canvas and then gallery wrapped it to create a contemporary frameless design. The rich canvas texture, stunning topographical terrain and easy-to-read color palette will ensure this map becomes the focal point in whatever room it is hung. See how quickly your frameless classic canvas wall map becomes your favorite conversation piece! Have a blast planning your next big road trip, reminiscing about past adventures and dreaming of that next bucket list destination on your list. Use your Gallery Wrapped Canvas Map of the USA to document your 50 State Challenge, as the map inspires you to visit every US State in your lifetime. Personalize your map with a favorite quote and your name by selecting one of our 6 customizable personalization options to give your map that extra special touch. Makes a fun gift idea for the traveler in your life who is always planning that next big trip. 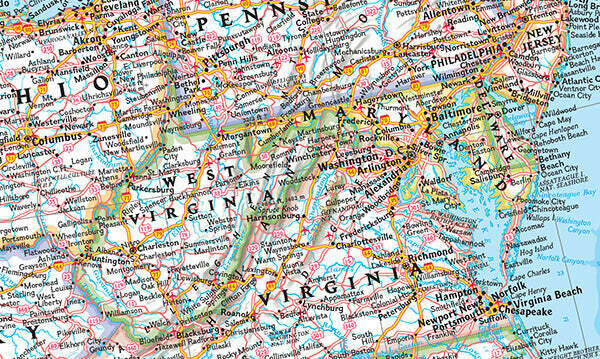 Order your Classic US map today and start pinning your story! We realize that one personalization design does not fit all! That’s why we have created 6 unique personalization templates for our canvas maps so you can truly make the map your own! Select the option you like best from the drop down menu above and enter your text in the designated box. Keep an eye out on your email (and spam folder) the next few days in case we have some questions about your personalization. Need some personalization inspiration? No problem! We’ve got you covered with our Personalization Ideas page! With clean modern lines due to its frameless design, our Gallery Wrapped Canvas Maps draw all the focus to the beauty of the map itself, creating a timeless interactive art piece you will be proud to show off to friends and family for many years to come. Our Frameless Canvas Maps are printed on premium canvas for an upgrade that will give you a rich, textured look and feel that ensures your map will stand out prominently wherever it is hung. Each canvas map is printed in house using our fancy-schmancy latex printer which creates a vibrant print that truly looks like a work of art! Did we mention that our Canvas Pin Maps make the perfect 2nd Anniversary Gift idea, which is traditionally the Cotton Anniversary? Pin where your love has traveled on your personalized Gallery Wrapped Canvas Map of the USA! 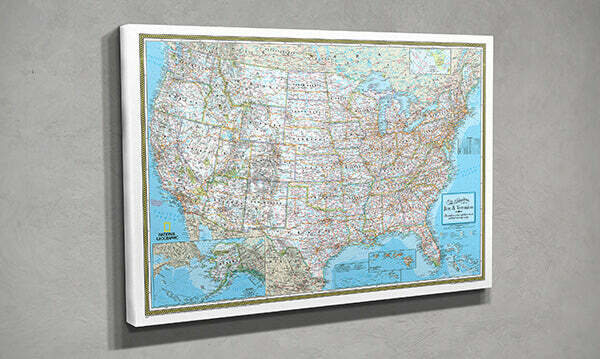 Give your Gallery Wrapped push pin map a little extra dimension and intrigue by adding a stylish float mount frame. 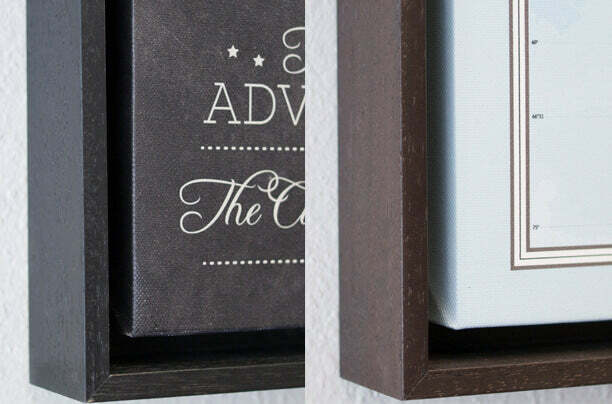 Float mount frames are a fresh, modern take on the traditional picture frame. Our Gallery Wrapped canvas travel maps are mounted inside the frame with a ½” gap on each side between the map and the frame to create the appearance that the map is floating within the frame. No dark magic here! Just a unique addition to your travel map that gives you a modern contemporary design that will look like your map came fresh out of an art gallery. Finished Size - 26" x 38"
Width of moulding on front - 7/16"
Every Push Pin Travel Map is handcrafted in The United States of America. We take great pride in every map we produce. We start by building a wooden frame which we then attach to a sheet of hardboard for superior durability. After that we affix sturdy foamcore board to the frame and then masterfully stretch the canvas map print over the frame with our slick stretching machine, while securing the canvas on the back to ensure nice, clean lines. A metal hanger is installed on the back so your map will arrive ready to hang right out of the box. Find out more details as well as answers to other popular questions in our FAQ section here. You, our amazing customers, asked for it and we delivered! We have partnered with National Geographic to officially license their stunning Classic United States map to be printed on premium canvas. We also designed the 6 unique personalization options you see here so you can truly make your Push Pin Travel Map your own! Since we ship so many of our maps as gifts, we do not include any invoices within the package. Feel free to leave a note at checkout though if you’d like us to include a gift note in a card. Your gallery wrapped canvas map will arrive ready to hang right out of the box. A hanger is already installed on the back of the map. After you have found the perfect location to proudly display your map, use the included durable bear claw hanger to make hanging your map a breeze. Easy peasy! The Avid Traveler – Everyone knows this person or couple! Stricken with wanderlust and always planning their next trip, it’s hard to track them down. Whether that is you, a significant other, friend, family member, or someone else you know who loves to travel; a travel map will be a gift they will cherish for a lifetime! Wedding or Engagement Gift - Perfect for the happy couple starting out on a new journey. Anniversary Gift – Our maps make the perfect gift for any anniversary! However, our paper maps are especially perfect for the 1st anniversary, which is the Paper anniversary. Our Canvas maps are ideal for the 2nd anniversary, which is the Cotton Anniversary. Retirement Gift – A fun gift idea for your co-worker or loved one who now has time to see the world! Wedding Day Guest Book/Seating Chart – Have your guests pin where they traveled from or their favorite travel destination! Or help them find their seat like we did at our wedding! Office/Company Map – Keep track of client or office locations or explore expansion markets. Kids Rooms – Start a love for geography and travel at an early age. Makes a great learning tool! Everything about this purchase was first class. The product, the packing/shipping, and the customer service communication. The push pin map is everything I hoped it would be. Excellent product! The most perfect piece for my home! My family and I travel A LOT and have been working on a map I contact glued to foam board in 2000! We upgraded to this map and it is just stunning! I have received so many compliments already! From the map size to the customization to the hardy construction it is just magnificent! Awesome job!! !